This evocative painting by Jack Unruh (unattributed, but signed by him) shows Laugerie-Haute before it collapsed. It was a rock shelter used by Palaeolithic salmon fishers. Several groups probably came together for massive fishing harvests 18 000 years ago. 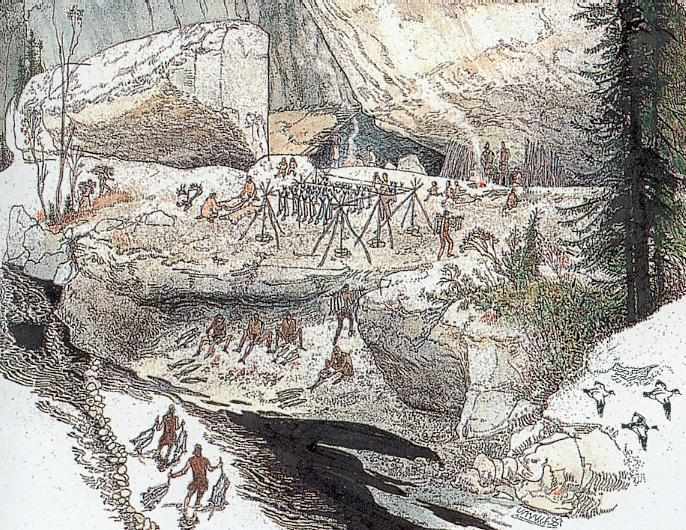 Note the stone weirs in the painting guiding the salmon to a pool for spearing, the people carrying strings of freshly caught salmon across the shallow pool, the scalers, cleaners and filleters seated beside the pool, the people carrying prepared fillets up the bank, and the racks of drying fish. On this larger image you can also see that the racks are held up by tripods, each one of which is stabilised by a cord or stick attached to a pile of rocks below each tripod, since there was no soil to dig the tripods into on the rock shelf swept clean by spring floods. Children are playing a chasing game, and someone else is bringing in firewood for the fires under the rock shelter, where there are two types of shelter. In one case there are some sticks stuck in the ground forming a wind shelter, with one side open to the river, and in another case there is a lean to against the rock overhang covered in hides. Sun drying of the fish would assure a plentiful winter food supply, and thousands of bones have been found in excavations in the area. Photo: the painting is by Jack Unruh, in National Geographic, Vol 174, No 4, October 1988.